I suspect most of us find it comforting to work to a deadline; it’s satisfying to cross a mental finishing line and feel a job is completed. But a deadline is a also a mindset… and that’s not the most useful thing for a journalist to possess right now. Now, I wasn’t aware about the shooting issue (although I know some subs who would be happy to see the reintroduction of this) but I think “1. the latest time for finishing something” is part of the problem. It says that, effectively, a deadline is a limit – a point beyond which the work cannot and must not continue; something that marks ceasation of a thought process, an action, an inspiration, a possibility. It is a restriction. There are two phrases relating to internet journalism that seriously drive me mad – “The deadline is now” and “First, second or nowhere”. This is the phrase most likely to be uttered by the person who believes it least. It the last resort of an online humbug; someone who doesn’t understand a fundamental truth about the internet – the deadline isn’t now because there is no deadline. A story should be growing all the time, changing all the time, and if the newspaper is working with the online world well enough the story has, in some shape or form, been out there since the first seed of an idea was planted. The internet community has been a part of the article in some way (a poll vote, a web forum, a Twitter stream, whatever) and plays as important a role as the reporter writing it. Deadlines hold us back; they make us think we’re first with the story when really we’re just the the first we know about with the story. Whether it’s someone from the public gallery in that big court trial broadcasting the outcome afterwards on the bus, or a local blogger with the right connection to the right person at the right time, someone else always knows. And they always, always share that knowledge. It’s just newspapers that hang onto knowledge until we judge the time is right to share; we are Knowledge Misers and the public will no longer accept us doling out snippets when it suits us. 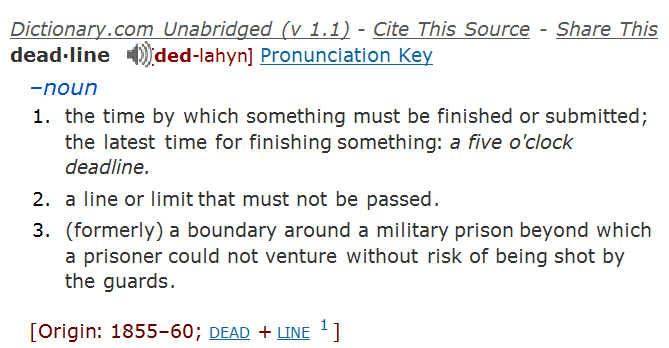 The phrase ‘First, Second or Nowhere’ is often linked to ‘The Deadline Is Now’ and, chillingly, may even be used in the same sentence. Yes SEO is important but so is being honest and providing exactly the information your readers are looking for, not luring them in like some kind of online Anglerfish, only to disappoint them with some spurious link or half-baked optimisation phrases. I think SEO is what the great Dilbert would describe as a ‘weasel‘ word; it sounds good while not really meaning much at all. From my point of view, I’d rather talk about online clarity, as in: Is it clear to visitors what this story is about? Search Engine Optimisation sounds good but what it means is that you’re playing to the bot’s rules – you are colluding with Google or your audience’s browser of choice to entice readers. The shortest route to the top of the Google search ranking is to publish what you know as soon as you know it and to label what the story is about with as much clarity as possible. Then link to whichever external sources are relevant, create a Google map or embed a YouTube video if it helps tell the story (Google likes helping friends of Google), and encourage as much interactivity around the story as you can, so more members of the online community are linking back to you. Thinking about attracting people rather web crawlers when we plan our articles and upload them should improve the quality of hits to the site, as well as the quantity. After all, I get at least 10 hits a day from people looking for cartoon avatars to use on Twitter, but it doesn’t mean my blog post is of the slightest use to them. I know some people in my newsroom who don’t believe in deadlines, for all the wrong reasons ;-DThe idea of online deadlines is an interesting one.While I agree it is something of a daft concept (if you don’t have to meet press deadlines, distribution deadlines etc), I think you will always need some form of cut off point to stop people forever fiddling with their work to no real effect.Otherwise, by the time a story is online, it could be on 10 other rival sites, meaning no-one sees it when they search for it.Of course, that then raises the question of whether people come to your site because it gets the news first or because it is the best at reporting it?This could be debated on and on and I can see both sides of that debate, but for now, I feel a deadline helps you get (your version of) the story up accurately and quickly, as you said, to publish what you know as soon as you know it.The story can (and should) evolve and be developed as time goes on.Do you think the mythical newspaper of the future will use deadlines (as initial cut off points I mean, not as in ‘that story is done, fuggedaboudit’) for online work, or will it be more open ended?Logistically and practically, they may have to, to link with the print edition and coincide with times in the day when the majority of staff are at work?Just realised I’ve rambled on a bit here, haven’t I? It’s an <>interesting<> ramble though 🙂Anyway, print journalism aside (deadlines for pages and presses are our shackles I fear) I’d like online reporting to operate in a similar way to Twitter.Maybe not 140 characters but certainly short, information-rich sentences which are uploaded instantly; like liveblogging a news article I guess. I love this concept – http://www.kansas.com/chelseabrooks/ – it’s such an immediate and compelling way of reporting a case. And because it’s constantly updating and growing your audience is encouraged to return to the page (with all the associated benefits of hit rates).With regards to the future, I don’t know if what a newspaper puts online will have too much bearing on what its print product is up to. I know we’re all flailing around trying to guess what the future holds my personal view is that (eventually) a standalone news product taking an Economist-style approach to local issues might work(although I also think that formats and frequency of publishing will have to change significantly). Good point about logistics – one of the big challenges will be how to set a ’24-hour’ newsroom (yeah, right!) against the staffing implications.